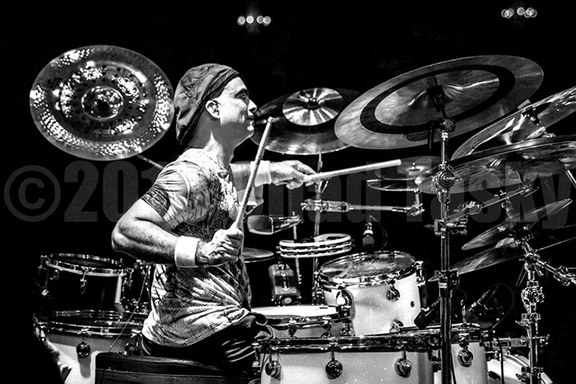 Jose “Pepe” Jimenez has played drums professionally since the age of 16 and is known for his versatility in different musical styles. He’s product of the Escuela Libre De Musica (Puerto Rico Performing Arts School), Musicians Institute and the Puerto Rico Conservatory of Music. Pepe has played with Luis Fonsi, El Reencuentro, Giovanni Hidalgo, Jerry Gonzales, Mark Anthony, Olga Tanon, Elvis Crespo, Luis Perico Ortiz, Gilberto Santa Rosa, Jerry Rivera, and The Puerto Rico Symphony Orchestra to name a few. Recordings include Ricardo Arjona, Olga Tanon, Armando Manzanero, Elvis Crespo, Ilan Chester, and Glenn Monroig among others. Since move to Las Vegas in 2002 has work in various production shows and bands including Storm, Mamma Mia, Cirque du Soleil Zumanity and Criss Angel Believe, Disney The Lion King, , Taylor Hicks, Latin Grammys, Nascar Awards. For a long time, Pepe wanted to experiment merging the folkloric rhythms and grooves from Puerto Rico and other parts of the world, with Funk , Jazz and Rock. After composing several songs, he got together with a group of very creative and open minded musicians interested in been a part of this musical adventure. Out of the interaction of all the musical influences from each musician, and the combination of playing styles, The Groove Culture was born.